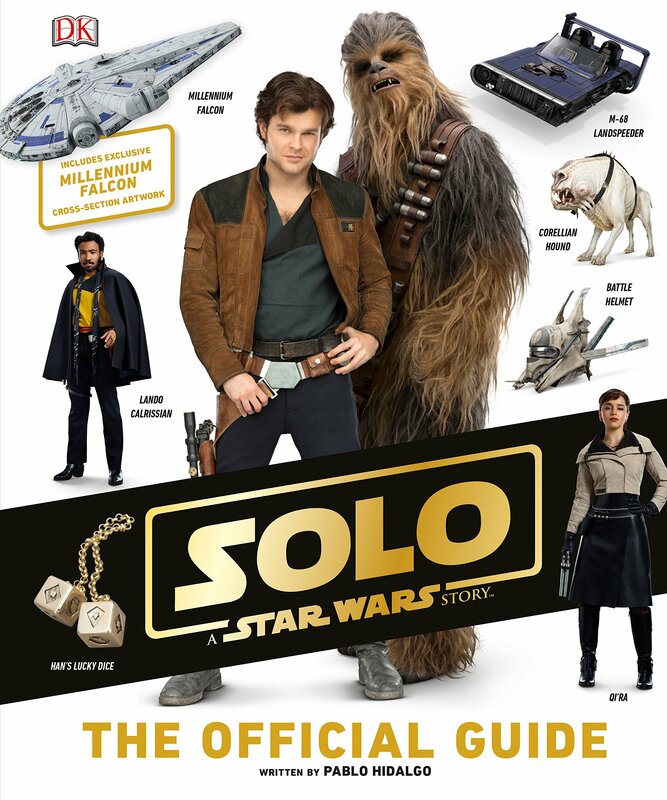 The Force Awakens had a visual dictionary, Rogue One had the ultimate visual guide, and now there is Solo: A Star Wars Story: The Official Guide. Written by Pablo Hidalgo as usual, this DK reference book provides some info on the creatures, aliens, vehicles, ships, characters and locations in Solo. However, it doesn’t give away everything. Some of the secrets in the movie remain even in this book, I suppose in an effort to clamp down on spoilers. As such, the book misses out on some opportunities to dive deeper into some of the things fans want to know about the most. The big character reveal? Not in this book. What Enfys Nest looks like under the helmet? Also, not in this book. But it does answer some questions and provide some cool pictures to drool over. While this official guide isn’t all encompassing, it does have some neat stuff in it. 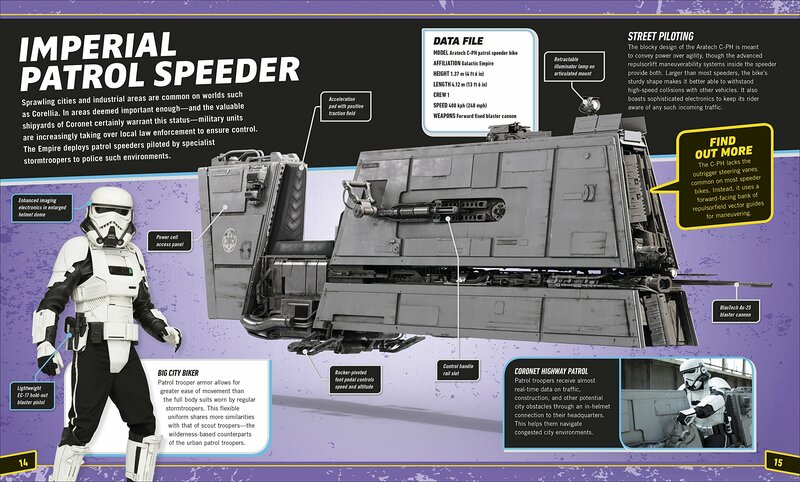 There’s a really cool two page spread of the droid workforce on Kessel which has images of 22 different droids. There’s also a map of the galaxy showcasing the planets included in Solo, and a map of the Kessel run which helps illustrate Han’s shortcut. There’s some nice images of the characters that help you get a better looks at their alien faces or colorful outfits. 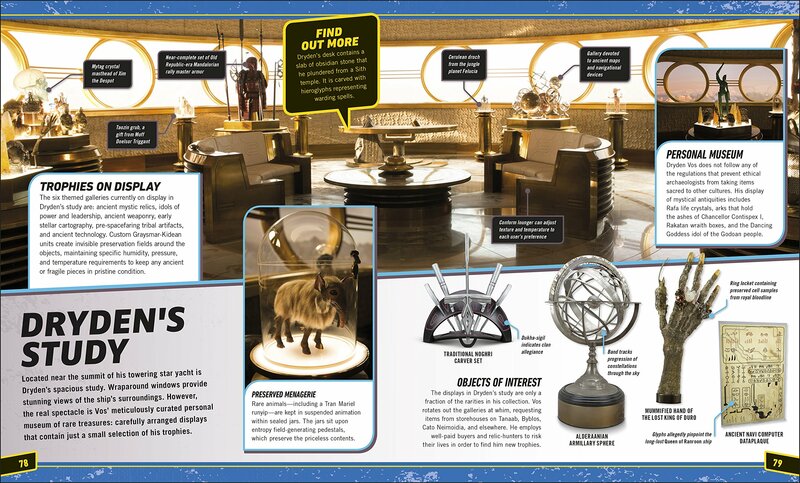 Plus there’s little highlights of items and gadgets featured in the film. Hidden in there is also a cross-section art piece of the new Millennium Falcon. There are some things that are a little lacking though. While a handful of the background characters and aliens are highlighted for the key scenes, there are a lot of them that aren’t covered. 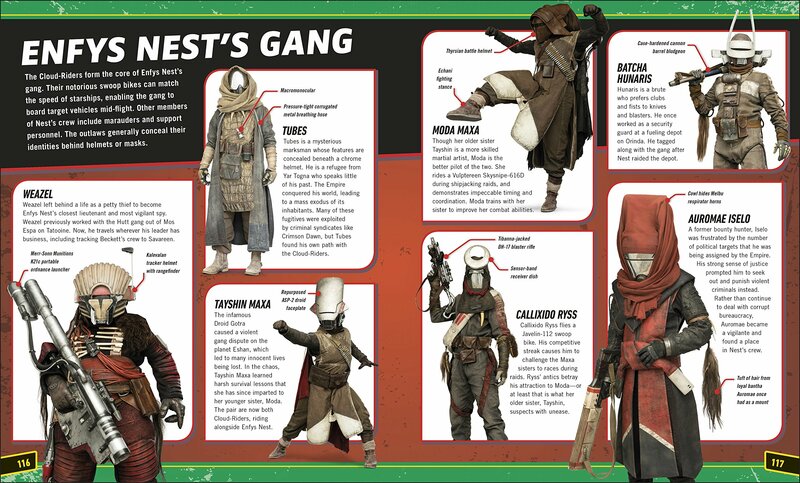 There’s also no images of Enfys Nest’s gang unmasked. And while there are some images of the trophies in Dryden Vos’ yacht, it’s not the best imagery. In fact the main image is just a screen still from the movie instead of a nice close up shot taken just for the book (or gathered from reference imagery). Some of the items are highlighted from reference photos, but somethings aren’t showed at all or are kept barely visible at a distance, which is disappointing. Of all the things I wanted to see in the movie, Dryden’s treasure trove was at the top of the list. It’s wouldn’t have been too hard to provide an image of each of his treasure tables with a nice head on shot, thus allowing viewers to see them in all their glory. As is, it leaves a lot to be desired. The same can be said for the aliens and background characters. You certainly get some of them, but there are a lot of strange creatures that you can only catch glimpses of in the movie, and they are nowhere to be seen in this book. They didn’t even bother to show the characters from Lando’s second card game. This book, of all places, is the one place where you expect to see these characters. Heck, it’s pretty much the only chance we have at seeing them aside from blurry, partial screen grabs from the film. It’s a big missed opportunity to not include them. Aside from missed imagery, there’s also something to be said about the arrangement of the book. It goes chronologically with the flow of the film for the most part. While this can be useful if you’re trying to find something chronologically, it also yields some more missed opportunities. For example, it’s always really neat when the DK books do an array of helmets or weapons, which is something this book doesn’t do. However, they did do the array of droids, one of the highlights of this book. Sometimes doing things by category can be a lot more appealing to the readers, especially when looking at things visually. And lets face it, there’s not a lot of detail on the weapons, helmets or vehicles. Those are definitely things that could have been done by category rather than chronologically, thus getting a visual pay off. The overall chronological format could be maintained, just with a few exceptions, and it wouldn’t hurt the organization of the book since there’s a nice table of contents for reference. And while there could be space concerns, it would be pretty easy to leave out the six pages at the end of the book that just cover the same ground as Abram’s “Art of” book. Not only does that section have the same images from the “Art of” book, but it’s entirely redundant. I’m really not sure why it’s in here at all. 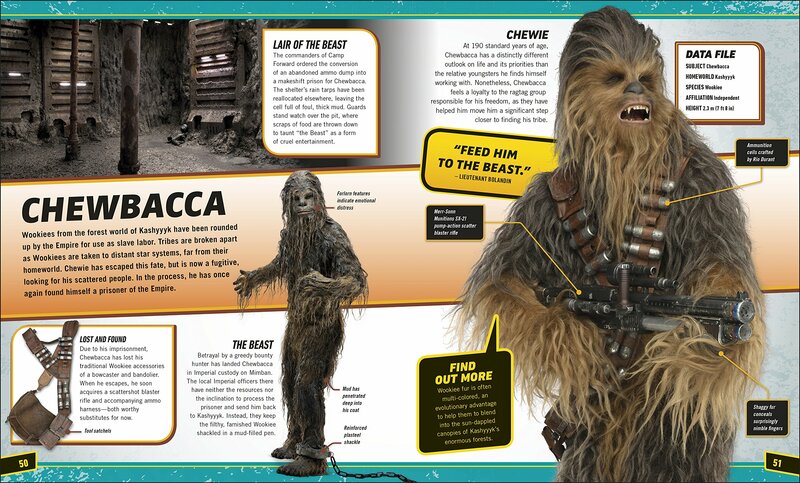 While Solo: A Star Wars Story: The Official Guide does miss some opportunities to really deliver some awesome stuff, it still contains some neat things you won’t find elsewhere. As such, it’s still a necessity for those diving deeper into Solo. It’s not perfect, but it’s still useful and has some enjoyable parts. There’s some neat bios, some fun pulls from Legends, and a lot names for stuff you would otherwise never know. In the end, I give it a three out of five metal bikinis. Whether you’re picking it up as a gift for a casual fan or an addition to your exhaustive Star Wars library, it’s probably one you won’t want to pass up.